Wasps boosted their hopes of a top-two Premiership finish with a bonus-point win over struggling Newcastle. After Mike Delany and Jimmy Gopperth traded penalties, tries from George Smith and Dan Robson put Wasps 15-3 up, but Taione Vea hit back on half-time. Robson's second score and a try from Thomas Young moments later put the visitors in control after the break. George McGuigan crossed to bring the Falcons to within seven points but Young's second try secured victory. 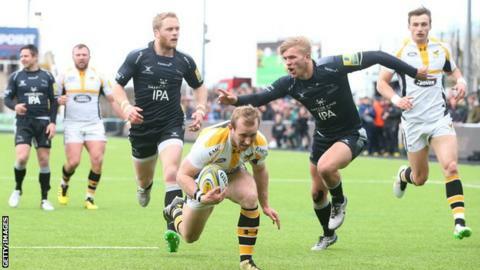 Wasps move one point behind second-placed Exeter, having denied Newcastle a losing bonus-point at the death. Following a scrappy opening period, the visitors took control through Australia international Smith's first Premiership try and Robson's opportunistic finish. Two tries in three minutes midway through the second half looked to have put Wasps out of sight at 27-13 but McGuigan powered over to give Newcastle hope. Andy Goode came on with 10 minutes remaining for his final Falcons appearance before his retirement but the former England fly-half was unable to inspire a comeback. Instead, Young's late score consigned the hosts to their fifth consecutive league defeat and they remain threatened by relegation, sitting just four points above bottom club London Irish. Newcastle Falcons: Hammersley; Tait, Harris, Powell, Watson; Delany, Young; Vickers, McGuigan, Vea, Green, Robinson, Wilson, Welch (capt), Latu. Replacements: Lawson, Rogers, Cusack, Hogg, Sinoti, Takulua, Goode, Agulla. Wasps: Miller; Wade, Daly, S Piutau, Bassett; Gopperth, Robson; Mullan (capt), Johnson, Cooper-Woolley, Launchbury, Myall, Young, Smith, Jones. Replacements: Festuccia, McIntyre, Swainston, Cannon, Hughes, Hampson, Jackson, Macken.